This superb figure consists of a Noblewoman, her eyes looking down, wearing a lace headdress covering her curled hair leading down to her perfectly formed and pure sculpted face. She wears a double string of beads around her neck leading down to her sculpted and engraved clothing in a darker tone alabaster. 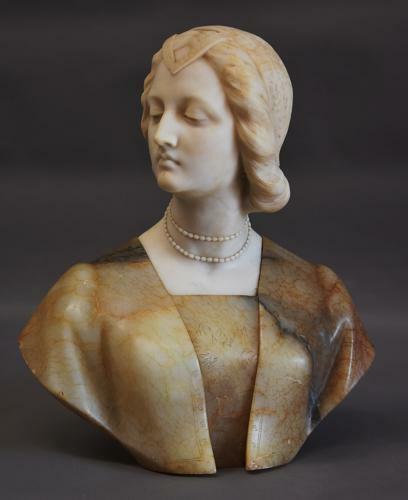 This figure is in very good condition for age with just a few small imperfections which is expected with the alabaster stone and can go straight into a home.